Hello, my name is Leona, and I’m addicted to reading….. yeah. Well. That surprises exactly nobody, right? I’ve developed a distinct preference, over the years, for specific non-fiction reading binge topics. Probably not coincidentally, those subjects tend to involve food and drink…. and then, as penance, I stack the books on my desk to force myself to blog about them. So here we go: the latest stack of non-fiction! It’s tagged on the back cover as “shrewd and irreverent”, and I’ll completely agree with that. It’s also compelling, informative, thought-provoking, and addictive–I tore through it almost non-stop, which doesn’t usually happen to me with non-fiction books. When I finished the book, I went to Amazon and ordered a copy for my bookshelf. Yes, Amazon=bad, whatever, I completely agree; yes, I’m a total hypocrite; whatever. It was late at night and I was in an impulse rush buy mood. This is exactly why Amazon survives in the first place. But I digress. Caught in the aforementioned impulsiveness, I purchased three of the suggested “also bought” books–also extremely unusual for me. Happily, two out of three were all excellent and enjoyable choices. That one exception was Andrew Barr’s previously published book, Wine Snobbery –and the only reason I didn’t really care for that one is because large chunks of the text were essentially the same from one book to the other. 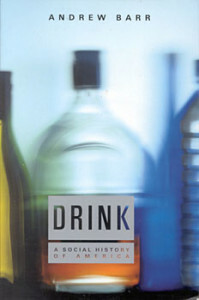 Wine Snobbery has a tighter focus on (duh) wine, while Drink focuses on the history of alcohol in America; still, the two books overlap enough that I’d recommend skipping the earlier book and just picking up Drink. 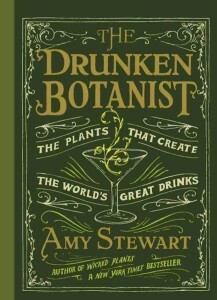 The other two books, The Drunken Botanist by Amy Stewart and America Walks Into A Bar by Christine Sismondo, were well worth the time and money. 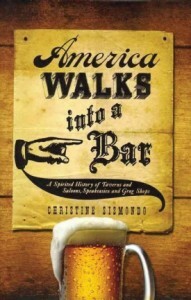 America is along the lines of Drink, with a specific focus on the history of “Taverns and Saloons, Speakeasies and Grog Shops”. It’s a fun read, as irreverent as Drink and just as fascinatingly informative. The Founding Fathers, along with various politicians and historical figures, feature heavily in this book–and are not always cast in a particularly complimentary light. One early pioneer in the Oregon cherry business was Seth Lewelling [in 1850]….an abolitionist who helped organize a local chapter of a new anti-slavery political party called the Republican Party. For his opposition to slavery, he was labeled a “black Republican”. He…[named] a new variety of cherry Black Republican so that [his critics] would have no choice but to eat their words…. Also, you know that pungent smell that always hangs around in the dentist’s office? Chances are it comes from clove extract, which is apparently a great dental anaesthetic. Go figure…. Drunken Botanist offers more than weird facts, though. It talks about the difference between types of alcohol, such as mezcal and tequila, applejack and apple brandy, nama and nigori. It offers information on the growth and geographical requirements of many referenced plants, and–most important for some folks!–provides a bunch of really cool mixed-drink recipes. I don’t do a lot with mixed drinks, but I was pretty fascinated with the recipes in this book. I mean, come on–The Aviation, Royal Tannenbaum, Prickly Pear Sangria, Bison Grass Cocktail…those are some cool names! 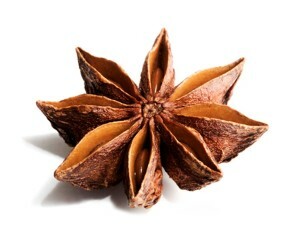 …as much as 90 percent of the world’s harvest of star anise has been purchased by the pharmaceutical industry to make Tamiflu, a drug used to combat flu pandemics. Hmmm. Is that why star anise is so hard to find these days? Wow. I will admit that I’ve tried his remedy in the past and it actually does work quite well. Especially with a hefty shot of honey and whiskey mixed in…. …and start another stack of books in that so-briefly clear spot on my desk! Oh, look, there’s that copy of Tom Doyle’s The Left-Hand Way I’ve been meaning to rave about…and the book about Russian myths and folklore…and the Holly Black book that my granddaughter brought home and I wound up devouring…. Hm. I’ve been doing even more reading lately than I thought. Well, I’ll take on the next stack in another post…. In the meanwhile, please do leave comments recommending other non-fiction books of great merit. And take a look at my Goodreads page, if you’re interested, to get an idea of other books I like and dislike. I’ve only listed the books I remember, mind you…. Now, I have to burrow back into my “stuff to do” pile. Which, as it’s Friday night, miiiiight just include a nice dinner out…. maybe even sushi…. mmmmmm.